Proper Technique for Youth Sports Training: How Important Is It? How Important is Proper Technique For Youth Sports Training? The IYCA forces you to think about your answer! Watch this video to learn how to get the most out of your youth sports training programs and ensure that your young athletes are able to reach their full potential. 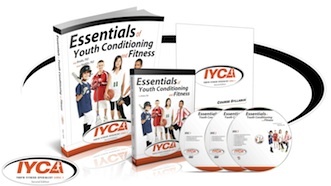 If you want to learn more about training young athletes and improving your youth sports training programs make sure you check out the IYCA’s Youth Fitness Specialist Certification. How do you create them? Now that’s a question I get asked virtually everyday. ages of 6 – 12.
either painted or taped on the ground. They should be only a few feet away from the line. rather a fine touch or precise execution of power. Have them walk back to the starting point and repeat. as lunge walking, hopping, 1-leg jumping or crawling. in place exactly where they are. ‘Green Light’ requires them to resume at normal speed. wonderful for young athletes…. and this is one of them! with their hands also on the floor/ground. so by crawling/jumping like a monkey. a feel for them and you could see what they looked like. "How do you create drills for young athletes, Brian?" You become certified through the IYCA. And this is a perfect time for you. myself and Pat Rigsby for absolutely no charge.